It all started with a longing for a mid week drink and hook up with my Soho comrade in cocktails. A short email verifying mutual consent, followed by the ‘where shall we go/meet banter’ ended two hours later with three fabulous Mayfair gallery invitations and a pondering of which of each would have the best, non-warm,white wine. However this was soon to be hugely usurped. Enter the fabulously professional and generous, prestige fragrance L’Oreal PR team who gently prodded me, reminding me I hadn’t yet replied to their offer to experience “a dramatic outdoor exhibition celebrating Ralph Lauren Fashion and Fragrances at No.1 New Bond St W1” previewed by cocktails and food at Mahiki followed by a super chic VIP cocktail party at the RL store. Now call me opportunistic but a) great team who you really like plus b) great product c) cocktails, d) VIP party and e) 4D light show extravaganza, kind of won hands down versus gallerying. Kicking off the evening at Mahiki in Dover Street, we had the opportunity to experience the fragrances as well as mingle with the other people in the small party while sipping on champagne. The latter is always a bonus. Now, I tend to concentrate on womens’ fragrance as mens’ fragrances don’t offer as much variety and subtlety for me as womens’ offerings but hells teeth, I’ll give this a go, cynical old synaesthete that I am. Looking at the packaging is the cleu de jour. Mr Lauren’s ultra clever with his marketing and you don’t get any bolder, any brasher nor any 1,2, 3, 4 approach than this. 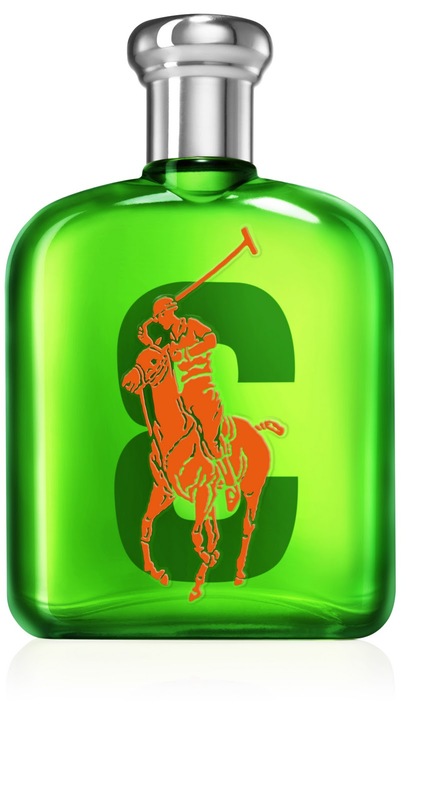 Aiming clearly for the 18-30, ‘see themselves as preppy, Fulham Road meets The Hamptons (wishful thinking)’ variety of young men out there, Ralph Lauren has introduced the ‘Big Pony’ stable (geddit?) of fragrances. These are hardly subtle in their delivery and packaged to relay a simple message: they are the archetypal, Ralph Lauren polo shirt come to life with clashing vibrant colours, packaging and an easy to understand selection process – you choose your scent by colour association. Do you go for sporty, citrus No. 1 in its bright blue packaging with bright yellow detailing that screams, ‘I’m No 1!’ or the more rounded, orangey, woody offering that offers itself up in bright orange with red detailing, screaming ‘I’m No.4!’ scent. You get the picture. These are not subtle and neither are they meant to be, but, in terms of young men and their selection process, the simplistic psychology and distinctive offering of ‘types of fragrance’ works for the youth market who buy into brand. This is fragrance selection by numbers. Literally. If you want my typical take on them, No 1 (Blue) is startlingly fresh and zesty that yells, ‘Me, I’ve just been to the gym, I’m extremely sporty and clean’ while our Bright Red No. 2 friend surprised me. On the night, I overlooked this one completely but, since spraying and sniffing, it’s a definite grower. Slightly oriental and sweet, it’s probably worn by Mr Nice guy in the office, who doesn’t seek out attention but you always think, ‘Would I, if pushed….’ . Now, we get to number 3 and 4 (respectively Green and Orange, which if you’re Glaswegian bears remarkable significance) and here’s the rub – No 4 is most popular in sales and is all instantly likeable, stylish, woody and fruity. Warm, generous and approachable, Mr Orange No 4 is the type of guy who you’d meet and like and perhaps let him buy you drinks in a bar, but is rather safe and ordinary. Nothing wrong with safe and ordinary, mind. If you like that sort of thing. And many do. Hey ho. However, it was Mr Green No 3 who grabbed my attention. A more subtle mix of fougere and wood with the subtlest hint of mint, this is the spangly sharp young dude who can wear Saville Row with panache. More confident than he should be and aching for maturity, Mr 3 may just end up being Mr Right or at least Mr Right Now. Less Green and more hidden depths, methinks. 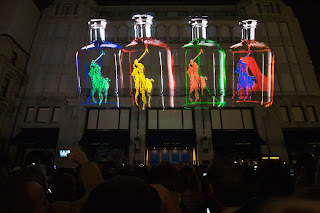 And there were plenty of Mr’s 1, 2, 3 and 4 at the VIP Ralph Lauren celebration to launch the magnificent 4D light show and The Big Pony fragrance collection. After mingling in a crammed and excited VIP area with the fashion crew including La Grande Dame herself, Ms Suzy Menkes, and celebrities, Jade Parfitt, Donna Air, Brian Friedman, Saffron Aldridge and Mr David Lauren, all were ushered outside for a 4D light show that was significantly breathtaking and a bona fide ‘fashion moment’. 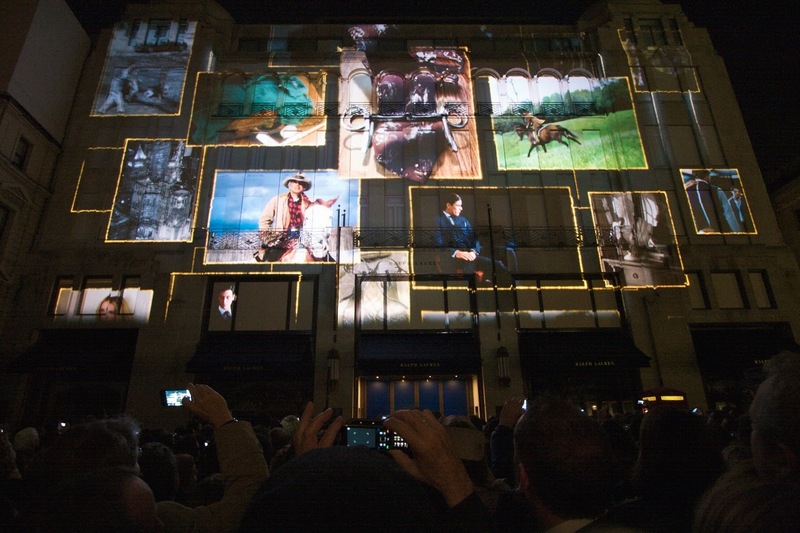 Through the use of advanced video mapping technology, the four dimensional light exhibition used the Ralph Lauren building as a canvas and marked a first for the fashion world. Seamlessly combining art, fashion, music and fragrance into a modern 4D moment that had the crowd hooting and cheering as Ralph waved from a window, the vibrant world of Ralph Lauren illuminated the London night sky as moving footage of iconic products were brought to life on the building façade in a culmination of art, fantasy and light. 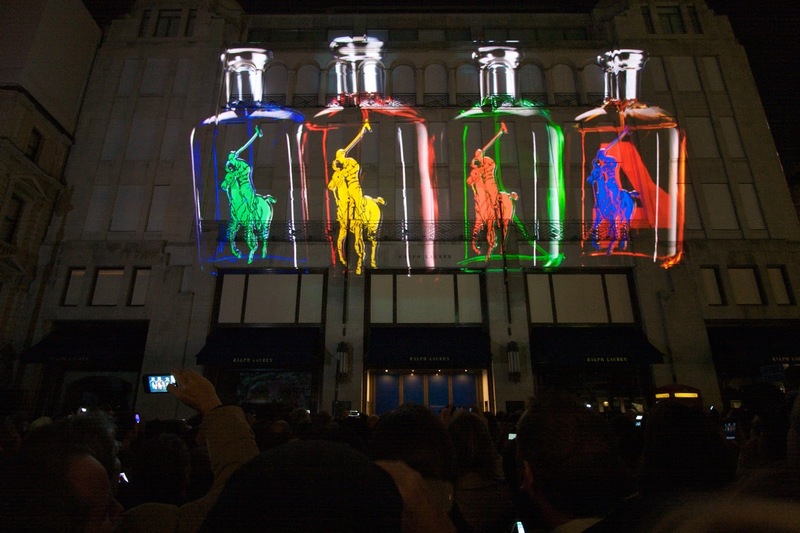 The spectacular infusion of the Big Pony Fragrance Collection included a light scenting of the Big Pony Fragrances for an ultimate sensory experience. Beat that for a unexpected Wednesday night in Mayfair*. The full Big Pony Collection includes 40ml, 75ml and 125ml eau de toilettes. A box set containing all four scents will also be available. *Thanks to the generous L’Oreal and Ralph Lauren teams who let this blogger experience such an event.